As London increasingly becomes a 24 hour city, then the transport networks are required to move more and more people around in the small hours. 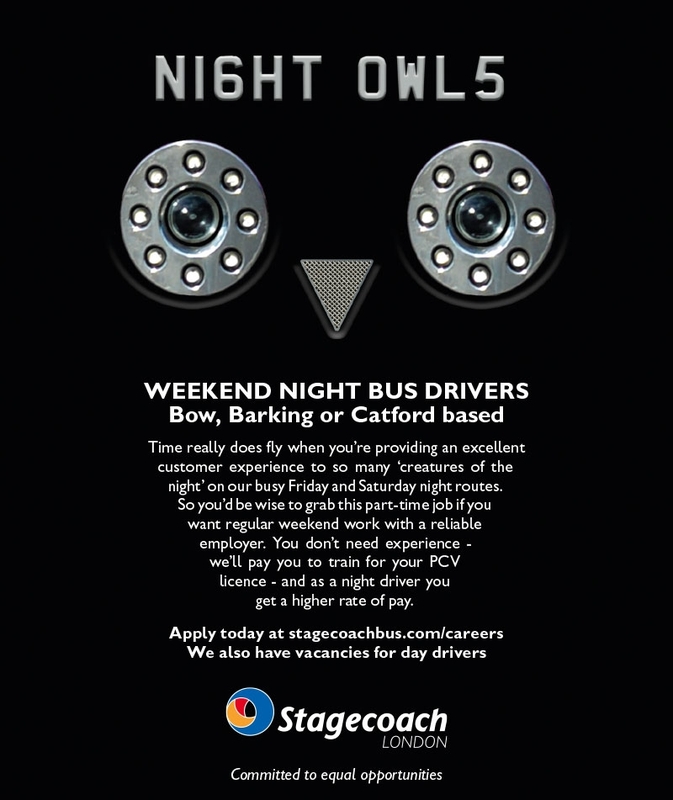 With the Tube poised to run for 24 hours on selected lines over Fridays and Saturdays, the Night Bus network were also required to increase capacity, and Stagecoach London needed to hire 20 Night Bus Drivers to support this. Stagecoach London wanted to mark themselves apart from other bus companies by not running adverts with pictures of buses on. We wanted something which would stand out on the page, which would be distinctive, maybe raise a smile, but still ‘be a bus driver advert’. Using recognisable elements from buses – from the number plate headline, the Routemaster headlight eyes, and radiator grill beak – and copy set to resemble the silhouette of an owl on a response paragraph perch, the advert was like nothing else published that week. At the same time as standing out visually, the advert has a fun and lively feel – something the client suggested the role itself can be at times. The short and to-the-point copy is delivered at a pace, quickly setting the scene and dispelling any possible doubts about ‘zero hours’ contracts which might be offered by alternative employers. The advert then swiftly moves onto the clincher: the paid training for a recognised qualification. While short, the copy gives just enough to spur the reader to find out more. The campaign, which appeared in a number of local newspapers around East and South-East London, and was also promoted via a PPC campaign on Facebook, generated a total of 250 applications. Of these, 83 were shortlisted. We’ll have to wait until January to see if we’ve pick up the RAD award!